In-house - self defined test: the database is internally collected and the testing protocol is self-defined. Generally the database is not publicly released, perhaps because of human-subject privacy concerns, and the protocols are not completely explained. As a consequence, results may not be comparable across such tests or reproducible by a third party. In-house - existing benchmark: the test is performed over a publicly available database, according to an existing protocol. Results are comparable with others obtained using the same protocol on the same database. Besides the trustworthiness problem, the main drawback is the risk of overfitting the data - that is, tuning the parameters of the algorithms to match only the data specific to this test. Independent - weakly supervised: the database is sequestered and is made available just before the beginning of the test. Samples are unlabelled (the filename does not carry information about the sample�s owner identity). The test is executed at the testee�s site and must be concluded within given time constraints. Results are determined by the evaluator from the comparison scores obtained by the testee during the test. The main criticism against this kind of evaluation is that it cannot prevent human intervention: visual inspection of the samples, result editing, etc., could in principle be carried out with sufficient resources. 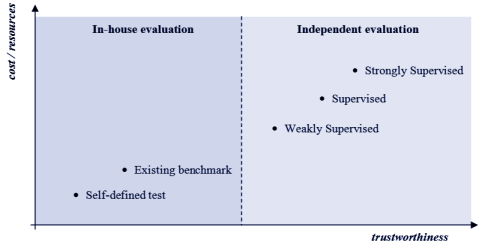 Independent - supervised: this approach is very similar to the independent weakly supervised evaluation but here the test is executed at the evaluator�s site on the testee�s hardware. The evaluator can better control the evaluation but: i) there is no way to compare computational efficiency (i.e., different hardware systems can be used); ii) some interesting statistics (e.g., template size, memory usage) cannot be obtained; iii) there is no way to prevent score normalization and template consolidation (i.e., techniques where information from previous comparisons is unfairly exploited to increase the accuracy in successive comparisons). Independent - strongly supervised: data are sequestered and not released before the conclusion of the test. Software components compliant to a given input/output protocol are tested at the evaluator�s site on the evaluator�s hardware. The tested algorithm is executed in a totally-controlled environment, where all input/output operations are strictly monitored. The main drawbacks are the large amount of time and resources necessary for the organization of such events. The Fingerprint Verification Competitions (FVC), co-organized by BioLab, are examples of independent - strongly supervised evaluations.